Sad to see this series go!! The plot was a pretty fast paced one, just like the first and second. This one’s got more heartbreaking moments and I’m glad to see the romance drama has cleared as well. 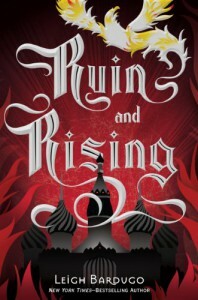 You still feel the awkward tension between Mal and Alina and it does induce moments of eyeball rolling but the heartbreaker comes when hell breaks loose and Nikolai gets taken away and becomes corrupted by the Darkling. Did I ever want to cry out loud in horrifying rage. Of all people Nikolai just HAD TO BE THE ONE. Just when things were getting a little better, when it looks like he might have snagged Alina and they might be together (just maybe?) but noooo! He had to be corrupted and although he valiantly did try to fight it my heart broke into two. (I guess you could say I’m all for Team Nikolai) Which of course clears the path for Mal and Alina to try again and rekindle their love. This love triangle was one where I was happy with who she would end up being with either way. Of course I would have preferred Nikolai because I loved his character and personality. But now that Mal stopped his stupidity the chemistry was back between himself and Alina. It just felt right. And even though the Darkling didn’t deserve it, kudos for Alina to take the high road and giving him a proper ending. I enjoyed reading this series. I’m sad to see this series come to an end. I didn’t realize how attached I were to some characters. It was a nice sigh of relief at the end though. When I closed the book after reading the final page. It was a beautiful but bittersweet ending.